Hello! I wanted to share a card I made for the current Your Next Stamp Sketch and Color Challenge #79:) I used both the sketch and colors for my card today. 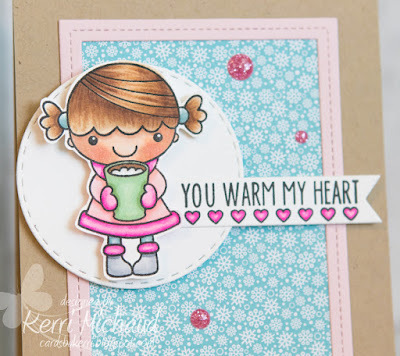 The image I used is from the super adorable Hot Cocoa Phoebe stamp set-LOVE! I stamped my image with Memento Tuxedo Black Ink and colored with Copic Markers. I then cut the image out and popped her up over my circle panel. I stamped the sentiment onto a banner cut with a YNS Fishtail/Banner Die Set One Die. The dp is from Doodlebug Designs Here Comes Santa Claus and I framed it using a Lawn Fawn Stitched Rectangle Frames Lawn Cut. To finish it off I added some sparkly Candy Land Glittered Gum Drops. So cute! Thanks for stopping by today!